Whether a new musical marriage between underground staples Jonny Pettersson and Kam Lee quite merits the label ‘supergroup’ is perhaps in itself a moot point. 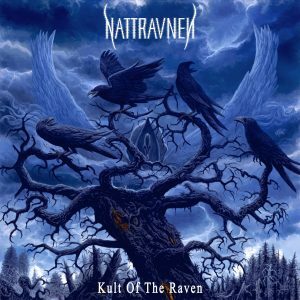 So hastily shoving that opening bandit to one side, let’s instead focus on Kult of the Raven, the atmospheric full length debut release from Nattravnen. The two key players in this union both have the death metal badge of honour pinned to their battlejacket, multi-instrumentalist Pettersson through his work with the likes of Heads For The Dead, Wombbath and Henry Kane. The prodigious vocal talents of Kam Lee, meanwhile, will require little ‘bigging up’ for fans of Death, Massacre and his current home, The Grotesquery. Both men are open to new challenges and when brought together their mutal desire to create and record a concept album enabled the pieces to fall neatly into place. Drawing inspiration from tales that Jonny’s grandmother told him about the mythical creature, Night Raven (Nattravnen) Kam was able to develop the album along this theme starting with the opening song, ‘The Night of the Raven,’ a track that pulses with gothic grandeur alongside the biting DM kicks. ‘Corvus Corax Crown’ initially hints at slower tempo only to explode like a well shaken bottle of fizz, almost gouging your eye out with the velocity in which the corks departs the bottle. On ‘Return To Nevermore’ Nattravnen give the impression of pounding you into the ground with the not so subtle use of a sledgehammer. So heavy you’ll struggle to look it in the eye, as intensity levels are ratcheted right up. What the pair have succeeded in doing is altering the tempo without ever losing any of the raw power, the mournful ‘The Anger Of Despair When Coping With Your Death’ being a prime example. And while they’re happy to bludgeon their way through a track when the need calls, that isn’t to say that Kult of the Raven is a melody free zone. There are hooks, albeit of a slightly bloodied variety, but on what could become their stage anthem, ‘Kingdom of the Nattravnen’, some shards of light are set free to poke through the darkness. Pettersson and Lee have both worked with Transcending Obscurity in the past so the high intensity Indian label is a natural host for this new dead-eyed pairing, with TO supremo Kunal Choksi even lending a further personal endorsement by designing the band’s logo.